those who can is a handbook for social reconstruction and social justice education for teachers and administrators. 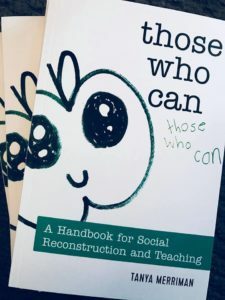 Those Who Can: A Handbook for Social Reconstruction and Teaching traces the development of a critical pedagogy within one educator’s personal history, and examines the implications of critical pedagogy from this educator’s perspective. The study draws from her years of practice and reflection, and reads as a handbook for other educators to use in the implementation of critical pedagogy. The first of four sections in Those Who Can: A Handbook for Social Reconstruction and Teaching proposes that all teachers share a set of responsibilities, and carries out an assessment of the educator’s work using these responsibilities as a benchmark. The second section considers teaching and learning from the perspective of a critical pedagogy. The third section offers possibilities for a critical pedagogy that others may use, including a school design and lesson plans. The fourth and final section includes a timeline of significant events in the history of public schools, as well as a glossary of terms and bibliography. Challenging the current trend of simplified and teacher-proof classrooms, Those Who Can: A Handbook for Social Reconstruction and Teaching concludes that social reconstruction and critical pedagogy both offer ways to meaningfully question the work of teaching and ways to find answers.